We have arrived back at the site that I tend to refer to as our slice of heaven the sheep farm at Fanjeaux. What made it so heavenly for me? Well, it is a small site of just 25 very generously sized pitches beside a tranquil lake which has generally provided a lot of leisure interest for nature enthusiasts with its mix of wildlife: frogs, tree frogs, water birds, birds of prey, butterflies and, of course, dragonflies and damselflies. Being a confirmed Darwinist, I should have realized that heaven doesn’t actually exist. We were here during our last trip in June and I began developing misgivings then. Farmer Luc and Nadine, our hosts, had developed concerns about a déséquilibre, an imbalance. 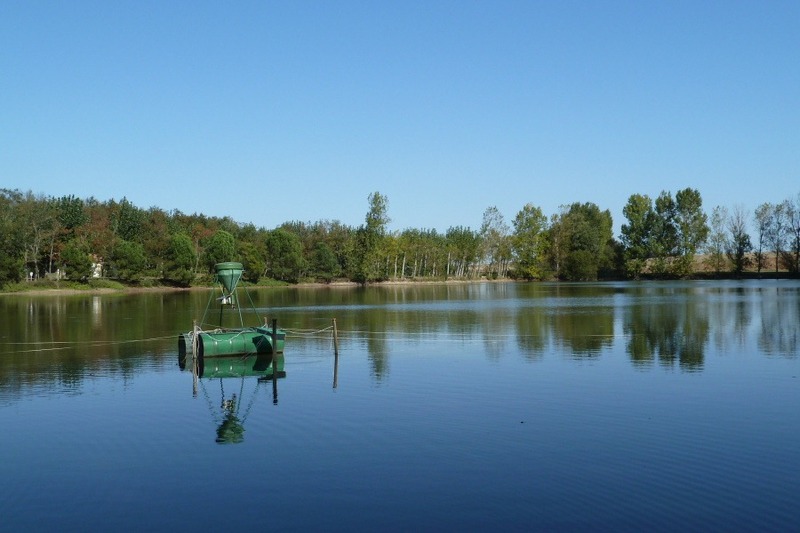 Luc et al have always been concerned that the lake, a source of irrigation water, was home to too many frogs – there were literally thousands of them – but now they were also concerned that it was becoming choked with a surfeit of pond weed having lost most of its fish a few years previously. Their approach to the biblical plague of frogs was typically Gallic – trap them and eat them. Their solution to the weed problem was to introduce a lot of huge (0.5m/18in long) Grass Carp to munch it. In June, the Carp had certainly dramatically reduced the amount of greenery in the water, so much so that the damselfly population seemed to be struggling to find somewhere to oviposit. There did seem to be fewer Odonata than previous years. Now for Satan. Beside the lake a large, green Heath-Robinson-like floating contraption has appeared. This turned out to be a device for delivering fish food pellets. In addition to the Grass Carp, the lake was now also being used by a fish farmer who had introduced many thousands of baby Koi Carp to grow on. The addition of food was necessary to sustain the unnaturally high density of fish. So, here we are again in September. We were told that, just last week, Mr. Fishbreeder extracted 100kgs/220lbs of Koi Carp from the lake. On one sunny day recently, I estimated seeing at least a further thousand, now considerably bigger, Koi in just one sunlit corner of the lake. Further along the lakeside, I spotted another basking shoal of probably another thousand. There are now very few waterfowl on the lake – just one family of young Mallards and a single young Coot who has since disappeared – and even the frogs seem noticeably fewer, though still numerous. Most disappointing for me, however, is the pathetically low number of Odonata; there’s just a handful of individuals remaining. Admittedly, their season is drawing to a close but there really should be more. There is absolutely no pond weed visible and, other than falling autumnal leaves from the surrounding Poplar trees, no floating vegetation on the water. My fears are as follows. Most waterfowl eat pond vegetation; there isn’t any. No food, no birds. Very interestingly though, others staying here report that they’ve witnessed the ducks, traditionally grazers, eating a fish which I hitherto thought they didn’t do. Without surface vegetation, damselflies cannot oviposit though dragonflies still can. However, Koi Carp will eat pretty much anything; they’ll certainly east freshly deposited dragonfly eggs and, I fear, any larvae that happen to develop. A normal density of fish, one that the lake could support naturally, would not consume everything but this is an artificially maintained, unnaturally high density that could well vacuum up every scrap of natural food available, especially as they are apparently not now being fed pellets. I’m quite sure any frog spawn would be viewed by them as a good food source, also. An Odonata population could potentially be destroyed in one year since adults live for only a few summer months. Frogs, living longer, will take more time to decline but, if their reproductive efforts simply feed huge amounts of fish, decline they will. I fear that this erstwhile wildlife haven – I’ve personally counted 17 species of Odonata on this one, modest lake – has now been transformed into something more resembling a wildlife desert. It is now a lake for intensive fish farming only. If this isn’t a déséquilibre, I don’t know what is. There is a silver lining for some – those that eat fish. There have always been Grey Herons resident snapping up frogs but now they think all their Christmases have come at once. A gull (I suspect a Yellow-legged Gull) is also taking a healthy interest in the lake and I watched it swallow three gold-coloured fish in the space of a a few minutes. Way to go, Gullie! More exotically, a Kingfisher may have taken up residence. Francine spotted it and I’ve heard it peeping.